Toestand is a temporary use organisation in Brussels, helping citizen activities and community groups access spaces at an affordable rent or for free. While the organisation undertakes the work of identifying buildings, negotiating with owners, renovating the spaces and recruiting tenants, it is also responsible for the daily management of the reactivated sites, bringing together different audiences. 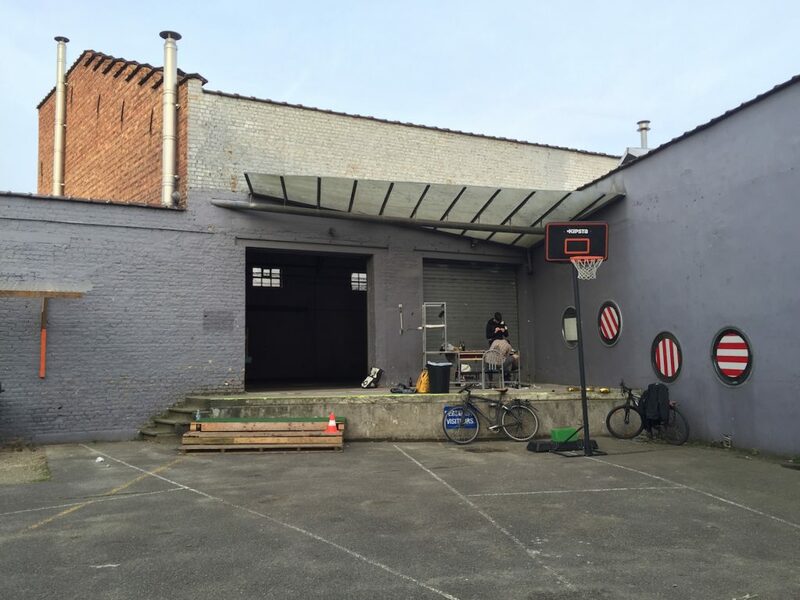 Working with private owners, municipalities and the metropolitan region of Brussels, Toestand has opened for temporary uses a variety of buildings and public spaces in different parts of the city, such as Allee Du Kaai, Marie Moskou in Saint-Gilles and Biestebroek in Anderlecht. How did you start working on temporary uses? When I joined Toestand, the organisation already existed. I had helped a bit as a volunteer in the beginning. Then I had been studying abroad, and when I graduated they needed someone to finish a project, write a manual on temporary use and give presentations about the organisation’s work to help other organisations do similar things. In my first year, in 2014, I focused mainly on getting to know the organisation, get everything structured and then in 2015 I started to look for projects to expand and make the organisation grow a bit. What does “growing” mean for Toestand? First we went abroad in the summer of 2015 to Ukraine where, with a dozen Belgian volunteers and a group of local young people, we transformed an abandoned and ruined cinema into a sort of community hub or new culture zone, a very polyvalent space. After this we felt that we could do this again, and in summer 2016 we went to Kosovo where with 40 people we transformed an abandoned heat exchanger into a cultural centre which is still active today, they recently hired their first personnel. Did this work abroad impact your work in Brussels? 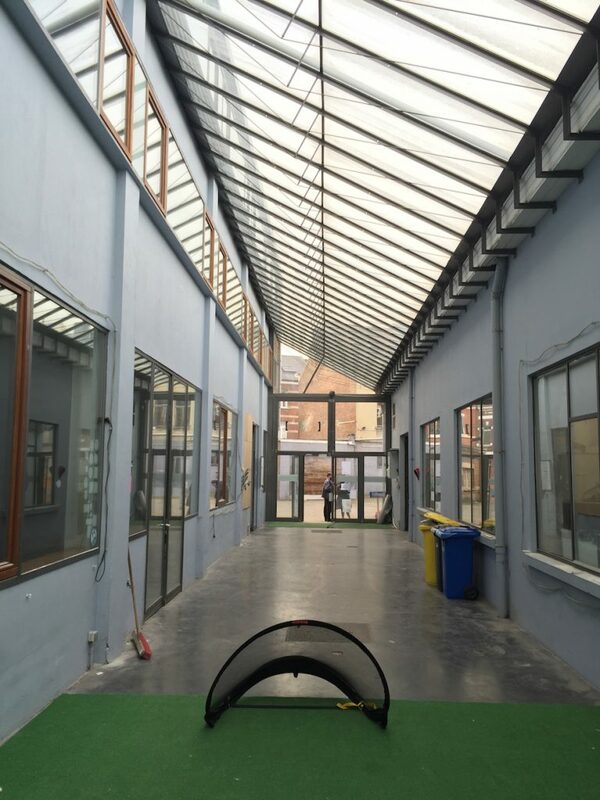 In the meanwhile, in Brussels, in 2015 we contacted two municipalities, Saint-Gilles and Anderlecht, and we got subsidies from the Brussels Capital Region for their municipal programmes within the frame of neighbourhood contracts to reactivate and repurpose spaces. Marie Moskou in Saint-Gilles is a public space, an underused square that we began to reactivate and re-appropriate with associations from the neighbourhood. At the same time, the plan was to install temporary installations for different user groups or different uses of the square. Testing those installations would then provide grounds of research for the architects that will redevelop the square. In the meanwhile, a street market was imposed upon us by the municipality, and as the market has priority over our project, we are literally pushed to the sides. Do neighbourhood contracts help you? It is a quite Brussels-specific context although there are similar things around, like the Gebietsbetreuung in Vienna, local offices that work on redeveloping neighbourhoods. In Brussels, the scheme is that the municipality proposes to the Brussels region the redevelopment of and investment into a specific neighbourhood. Once this is approved by the region, the municipality designates an architectural office that does a study on ‘what we want to do in terms of public space interventions, housing or social and cultural economic activities.’ Once it is finalised, this program is presented to the municipality and the region. If it is accepted, it is funded, usually with around 15 million euro investment, from which the region finances 80% and the municipality finances 20%, mostly spending on public space, housing or other infrastructure works, and about 2 million euros on socio-economic activities. We came into this picture as part of the program, proposing the temporary activation of space that is beneficial for the neighbourhood. These neighbourhood contracts are always limited in time and space, with a limited parameter within which they can act, and also a limited period, four years plus one preliminary year to do the study, plus one year to finish the construction. It is usually a good deal for a municipality to give an injection of capital into one specific part of their area, although it is often being criticised as planned gentrification. How do you structure your work in different areas? We do three things: we experiment, we support and we develop and distribute expertise. First, experimenting could be a very short term thing, we could do a one night party in an abandoned space which we have done a few times, with or without permission; we can do an intervention of a week abroad where during one week we can construct something which we can leave as an autonomous place. Or we have something long term which we call our spontaneous action zones: we have three like this now in Brussels. Second, we support initiatives with logistics, reusing and recuperating materials, communication with personnel and volunteers. Out of all these actions, we develop a lot of know-how, a specific expertise. Then we distribute this expertise through the manual as well as talks and presentations. Currently we have twelve people, nine of which work on spontaneous action zones, so the focus is very much on the most visible part and the most impactful part, which are these spaces that we manage and make available to organisations. We create and curate as well. We would like to work more on the other things, we would like to be more experimental, to organise more actions and interventions. Currently we are looking for funding for that as we find this is valuable work and we can find a lot of people interested in joining that that but we also need to find the coaching of volunteers and we need to have people on that as well. So far we have had a small subsidy from the Flemish community but this support was actually halved this year. Our work is very dependent on time-limited subsidies that require a lot of administrative work. We have been existing for four years so we feel we are at the step where we can soon bypass the mere project-based existence and develop the stable core of organisation that can focus on generating and sharing expertise. Ideally, spontaneous actions should become financially independent from the core work of the organisation: the will have to find a subsidy, a business model or a donation model. 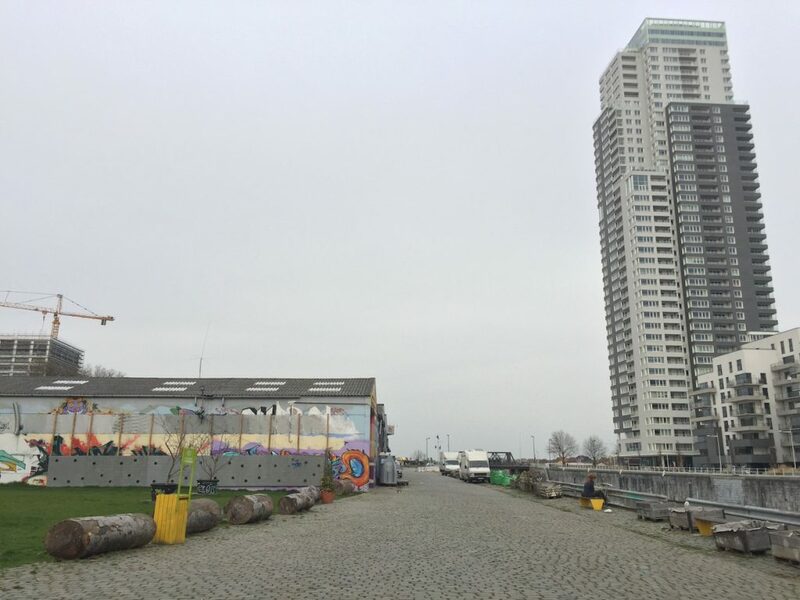 Right now, our projects Marie Moskou and Biestebroek are linked to neighbourhood contracts; the third, Allee Du Kaai is from a public tender by a governmental environmental agency. Can you describe these projects? Alledukaai is in a central part of Brussels, a former harbour zone right at the canal. The government wanted to construct a park there but they realised that they cannot manage the abandoned area while waiting for the port to be built. Therefore they decided to create a public tender for people to organise the temporary occupation of this space, to actually have an impact on the neighbourhood. We won the tender: that was our first big project with government money involved. At Alledukaai, we host 44 organisations that either do something punctual like a small festival or a one-day event, or they have recurring activities like a weekly box course or people’s kitchen or a skate park available three times a week. All of these organisations together generate a lot of activities and lots of visits: around 2300 activities per year with about 40,000 visitors altogether, a large number compared to the limited means we have, and very different from more traditional community centres with a more homogenous public. Who frequents Allee Du Kaai? Three times a week we have an “open house” where lots of youngsters from Molenbeek come to play table tennis and just chill. 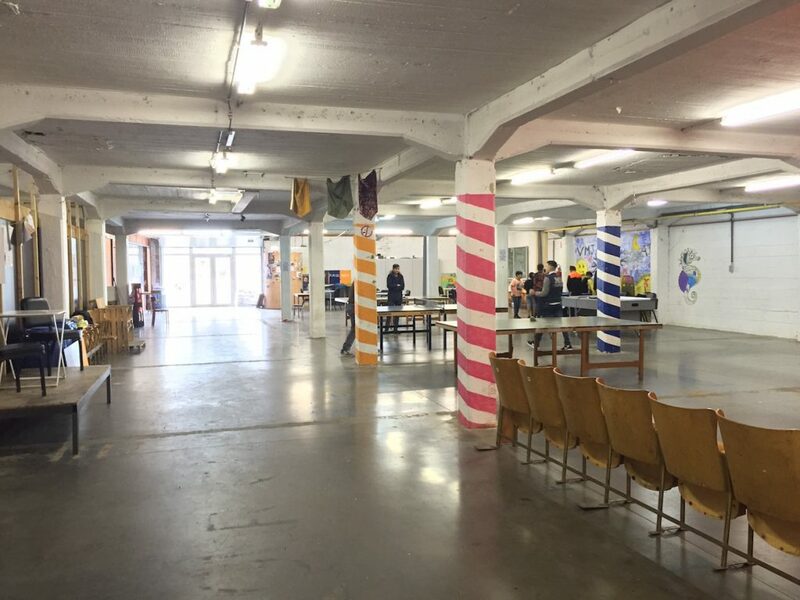 We also have a bar, and on Saturdays an open kitchen run by Collectactif, a collective with many undocumented migrants. We also have some middle-class white people that come and have a beer or a coffee during the day. 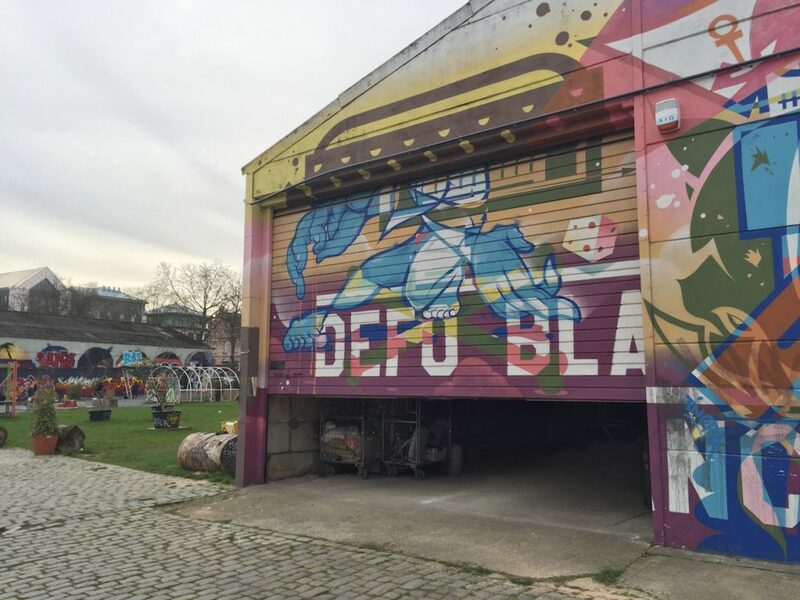 The skate park is in the biggest warehouse in the area where jams and festivals are also organised. The key ingredient of our work there is managing diversity which comes in all forms and shapes such as conflict mediation. Different people use the same kitchen, like when you live together with a few people in a shared flat. One always does the dishes, the other never. It creates conflict. Mediating these conflicts takes a lot of time and requires very specific skills that are not evident for everyone. Also for the people involved, the partners, it is not always easy to share lots of space and be with lots of different public. One of the organisations works with psychiatric patients who are mostly middle aged, 40 to 60 years old and they have an activity on the same day as when the youngsters from Molenbeek are there. They are completely different groups and we still force them to use the same space at the same time: it generates very interesting interactions, not always conflicts but often situations that are not easy to manage by the organisations. We feel there is an added value in bringing these groups together who otherwise would not know about each other’s existence. They would not meet let alone exchange or interact. What is the financial agreement with these activities? While in Biestebroek, we ask organisations to participate to our expenses because we need to pay for heating and electricity, this is not the case at Allee Du Kaai. The organisations on site can generate some revenues but they cannot ask for a fixed price. We ask them to organise activities all on a pay-as-you-wish basis: this is the exchange for not paying rent. We have a bar in the area that generates a bit of revenue and the skate park also has one, as does the artistic centre Barlok does, with very accessible prices. In this way each can generate some financial autonomy. Is your other large project, Biestebroek, similar to Allee Du Kaai? The idea to open a temporary community centre like Allee Du Kaai in another part of the city, Anderlecht, already existed before we began talks about the specific site. In fact, we even had funding before we had the building! First we started negotiating with the owner of a private building in the same area, and when it did not work out, we found a really big site in a relatively good shape owned by the municipality, with plans to transform it into an administrative centre. They gave us a contract and funding for temporary occupation for an undetermined amount of time, meaning until the construction works would start. We expect to have to leave the building by the end of the year. How did you start working on the site, knowing that your activities there are limited in time? The limitation of this tenancy to one year scared away many of our potential partners, even if we agreed on a 3-month notice. Originally it was one month, but a lot of organisations that were interested found that the one-month notice was too short. Through political pressure we managed to change it to three months: at least it offers the organisations a bit of a buffer to find a new place. We opened on 14 January this year. Before that we were doing preliminary work, renovating it, making it safe, in terms of fire hazard and accessibility, access control. And we have been investing a lot of time in developing a local network of associations: in the summer of 2016, we had a student working for us who made an inventory of all the associations in the neighbourhood. In September, we started meeting all these organisations and once we started offering space to people the snowball effect started kicking in. Once we started activating and shaping the project and showed the building to a critical mass of people and they began to see the potential, it was more about selecting applicants than actively recruiting tenants. Based on the first contacts we made, we had a preliminary configuration, divided the spaces, like ‘this could be for co-working office, this could be for movement activities like sports, dance and theatre, this could be a space for more artistic studios.’ Beforehand we had a certain number of organisations in your mind, then we created a space for them and were examining if others could join in. It is like a puzzle in which diversity and values produced by the tenants are the most important for us, more than whether they can contribute financially. How do you deal with organisations that cannot really contribute? In Biestebroek it has become an issue because the subsidy we have is not sufficient to cover all the expenses in terms of energy and water. So it is essential for us that there is also revenue for that. We have tried to create a balance by finding tenants that contribute more so others do not need to contribute as much or not at all. In a way we often have been playing with the metaphor of ‘the city within the city’. Once a temporary use is over, how can you move the communities that have been formed, to another place? There are other spaces that are being proposed to us: we feel that the success we are having with projects like Allee Du Kaai, Biestebroek and Marie Moskou makes people come to us with questions, buildings and proposals. There are many options for us: do we want to take them to a new space or do we want to start all over again? Or do we want to create a space and buy the building on the long run? These are the questions we discuss nowadays. There is definitely a connection between the sites: for example, some of the partners on Allee Du Kaai have joined and moved to Biestebroek because it was more convenient for them. Others are more local, and will not likely move to a new project with us. This mix of local and above-local partners is part of the diversity of actors and thus people coming to our projects. For us it is very important that our spaces have a strong local dimension since they are quite far away from each other. The Biestebroek site officially closed at the end of 2017 because of the planned construction works. Brussels, Community , circular economy, civic space, co-working, commons, community, culture, English, governance, heritage, integration, municipality, public spaces, social inclusion, temporary use.